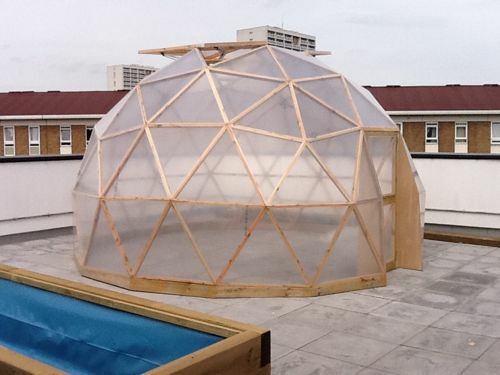 This is a standard GD18 grow-dome kit built for a school in London, what''s interesting about this job is that it was built on the roof where they where having a rooftop garden, raised bed growing space for teaching horticulture. In London space is at a premium so building on the roof was a great way of finding a use for a 50 Sqm area. There where several raised beds a pond and the grow-dome all comfortably fitted onto the flat roof. The only thing that we had to be carful about was fixing the dome down, luckily the roof was paved with 50mm concrete pavers so we could fix into these without risking going into the roof and damaging the weatherproof membrane. Below is a stop frame animation o f the build which took about 5 hours to complete.